Jam-packed with stuff for all Radio Enthusiasts! such as band information, repeaters or licencing details! 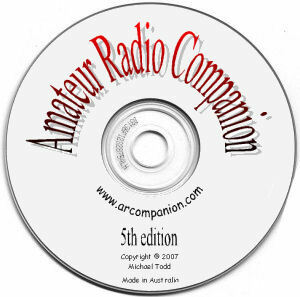 Whether you are an experienced operator with your own antenna farm and many QSOs under your belt, a CB'er, scanner enthusiast or someone who aspires to be a "Ham", this CD is a useful source of information about radio and electronics. What is on the CD? 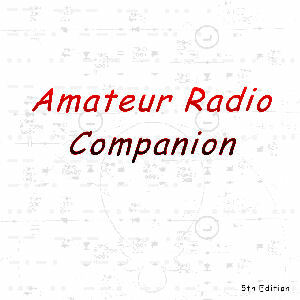 The 5th edition of the Amateur Radio Companion, released in February 2007, continues to meet the standard set by previous versions. The material found in previous editions has been revised and updated, and a few new bits and pieces added! A fantastic educational product, it must certainly be unique among references written for Hams and CBers. Where would you find another reference with this range and depth of information? It has almost 700MB and over 600 pages on the disc. The actual count is somewhere above 650 pages of information - without trying to pad the number by counting ancillary frames and index lists. 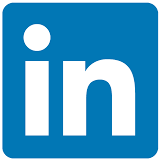 The information is written in an easy-to-read style and it has internet links to help you along the way. A printed book version would be simply massive! There is so much material on the CD that a book could be written in summary, so I will jot down some of the highlights. 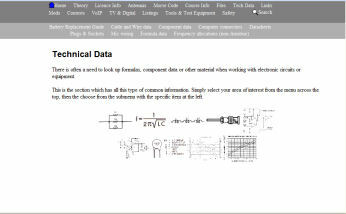 There is a huge amount of reference material - coaxial cable tables, copper wire sizes, semiconductor datasheets, electronics component data and commonly used formulas, as well as connectors, plugs and sockets and many diagrams for easy identification. Something new in this section is microphone wiring diagrams for a great many CBs and 8-pin connector wiring for common ham rigs, as well as international AC mains plugs and sockets. A huge amount of software for electronics and radio enthusiasts - circuit design, antennas, callsign lookup, radio modifications, morse code and packet radio - and both MS-DOS / Windows and Linux are supported. Despite the amount of software on the CD, the files section is merely a backup to the information provided - the main thrust of the CD remains a reference source. 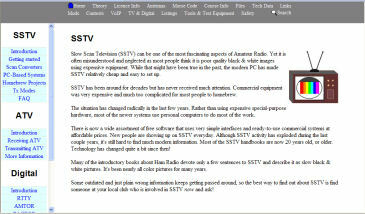 On top of all this there is a "from the ground up" look at other areas of interest in radio both old and new: Slow scan TV (SSTV) and ATV (fast scan), Digital modes, Voice-over-IP / Internet Radio Linking, a handy section on antennas and antenna design, and a catalog of world-wide frequency allocations, repeater and beacon lists and more. The same format from the previous editions has been retained - the interface is HTML driven which means you browse the CD as if you were on the Internet, and if you have an Internet connection there are links off the CD to other sites of interest to all users. It is simple, straightforward and easy to use. And if you happen to get stuck for finding something it includes a powerful search engine for locating pages on the CD. It comes packaged in the now-familiar slimline case - ideal to take with you when travelling. It is another marvellous effort - and don't let the low price fool you into thinking it will be anything but high quality. You could truly pay much more and still be happy.